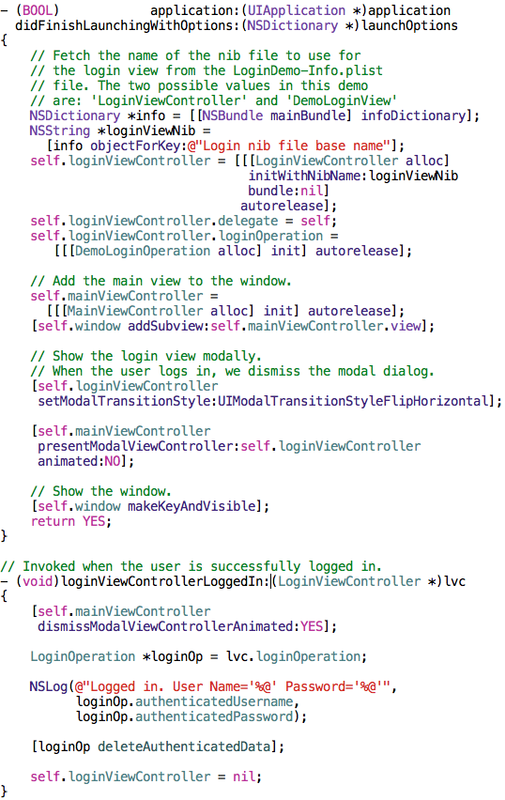 The following screenshot shows code from the demo’s app delegate file, which configures the LoginViewController and displays it in a modal dialog. Notice that the View used to render the LoginViewController is determined at runtime based on a config value from the bundle’s info plist. I wrote a simple RESTful authentication service in WCF, which I hosted on my main desktop at home. The DemoLoginOperation has code that calls that service to perform authentication. It works like a champ, even if that service is unavailable. If you’re interested in getting an overview of how the code works, let me know and I’ll consider writing one up. Hi – I stumbled across your code example for the iOS login and first, thank you for posting this. 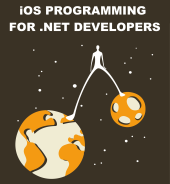 I am attempting to port an Android app to iOS (very first iOS app and have never done Objective C before) and this post was extremely helpful in getting me started on the authentication path. I have downloaded your project from Git and attempting to modify it to create a sandbox app that simply handles authentication. When I try to inject the didReceiveAuthenticationChallenge, didReceiveResponse, didReceiveData and connectionDidFinishLoading methods, they are never used. I know that probably doesn’t give you much to go on, but basically I tried adding those methods and with the authenticateImpl method running on a separate thread, they never fire. If I modify your “beginAuthenticateUsername” to look like my snippet below, they do fire… Basically, I’m stuck and I’m not sure how to make the “did” methods fire on the same thread as the authenticateImpl…if that makes any sense at all. I’d be happy to send along my code if you would be able to help me offline? // Copy the credentials for later use. // Create an operation that will be executed async. // Enqueue the operation so that it will be executed on a worker thread.